Try our new Bright Color Drawstring Bags. 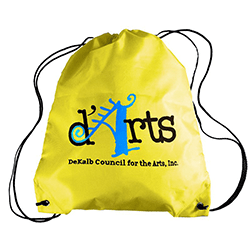 These polyester drawstring bags will brighten up any event! Fill these colorful totes with your business gear! These sacks make perfect beach accessories, book bags, gym totes or gift bags. 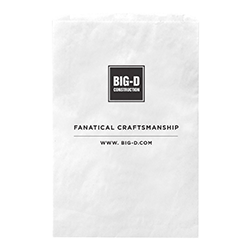 Classic White Kraft Paper Shoppers bag are an economical way to support your business – personalize them to build MORE business! These are great in gift shops or used in arts and crafts, beauty supplies, bridal, and clothing stores. 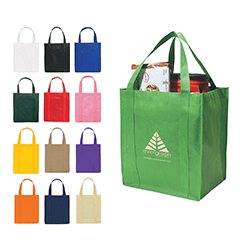 Low-cost shopping tote bags provide priceless advertising exposure at events and conventions! Not to mention most people will use for everyday use. 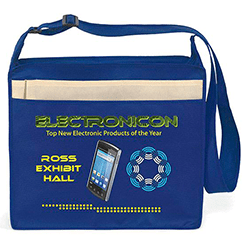 These bags will make you a promotional genius! Bag your audience with this eye-catching promotion! 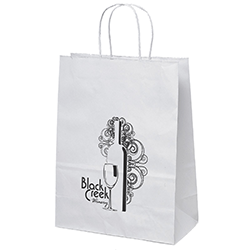 Our white merchandise bags are made from white Kraft paper and feature a serrated top. Each bag measures 12″ x 18″ with a 2 ¾” gusset and is perfect for museums, gift shops, arts and crafts stores and much more! Our imprinting options make this a promotion to remember. Just customize with your brand name or logo! 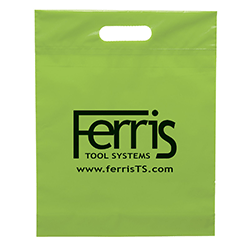 Grab the attention of potential clients with this customized plastic convention bag! Perfect for carrying away all your promotional goodies at the next trade show! Our Transporter bag is made out of 100 GSM premium non-woven polypropylene featuring zippered closure, 2″ wide by 52″ long adjustable shoulder strap, document pouch, 2 contrasting front pockets, 2 contrasting pen pockets, and a utility pocket on each gusset. You can carry this in your next business meeting or trade show. Perfect for organizing all your paperwork and folders.